Oh, Target. I know you’ve been stalking me. How else could you know? First, it was the planner that matches my jacket. [And technically I stole/borrowed/pleaded/own that jacket from my sister-in-law. She has a bazillion jackets.] The only planner like that in the whole store. 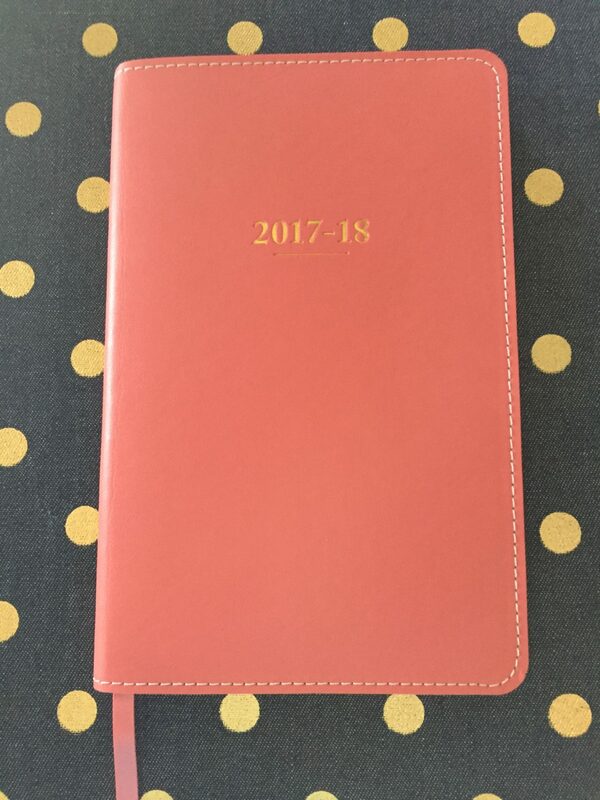 There was no other pink-ish, corally planner. Only this one. Discarded aisles away from any office supplies. I looked it over and left it. Left it! Presumably to think about my purchase. And I did think about it. How it was the right color and size. It would fit in my purse. How I have rarely met a planner I didn’t like. How I really did think it would match my jacket. Which would make it one of my favorite colors. Yada, yada, yada. So I went back, unsure where to even look. Where does one look for discarded planners? After a thorough search of Target, I finally found it on an end cap near the Keurigs. Which isn’t that far from the Office Supplies section at all! It was migrating home, hoping I would come back. I liked my purchase so much I kept stashing it in my purse and planning things. Appointments previously (and still, don’t worry!) entrusted to my phone were written out so I could see my month at a glance. Then, one day, at least a week later, when running in and out for deodorant or dog food – some dire need – that required a quick dash in and out, I saw the binder. Binders just have no business looking cute. Or calling to me from the office supplies section. My favorite section of the store. How I could see the polka dots while the binder was on the shelf and I was dashing by is beyond me – but it happened. So there you go. My new school purchases for the year. Not too bad if I can keep it to just these two. Hoping Target is not planning anything else for me for back to school. And my planner came in handy!! Instead of thinking about planning, I committed. Words were written in the tiny squares. A friend and I met for coffee. We had laughingly talked about having a Netflix marathon – where we would watch the British Christmas specials from different seasons of a show back-to-back [Call the Midwife, for those who need to know] and drink tea and eat shortbread cookies, which we would refer to as biscuits. Suddenly, and for no other reason than that I had a new planner, I yanked my corally pink planner out, we selected a date in July and our marathon is now secure. Christmas in July. Very exciting. One more thing that actually got planned – and then got done (!) – this summer! Just for some inspiration. Every April 1st, my phone buzzes and says to call Brick Street Cafe and reserve a large table for Mother’s Day. We did go one Mother’s Day, years ago, and it was quite memorable. But with a large family, it is not something that can be pulled off last-minute. The last couple of years, everyone has sort of done their own thing. This summer, however, my sister’s family was here from Cambodia and I was struck with inspiration. Why not have a girls’ day lunch at Brick Street? So I threw the idea and a date out and everyone said yes! Amazing! I’m throwing it back to you now. School is not upon us yet. Plan something for now. Or a fall getaway. Or a girls’ day. Or Christmas in July if you like biscuits and tea! Fill in a square in your planner with something exciting. And next time you see your perfect planner in the vitamin aisle, throw it in your cart. Do not delay! Thank you Target for making sure I would find my planner and that it matched my jacket. You are a little creepy but I love you. You have done your homework well. What about you? Let me know if Target has lured you in recently or if you planned something super fun! Or if we are soul sisters, because you too, love the Office Supplies section and back to school specials. I’d love to hear from you.